10.30 pm, Friday eve of Valentine and I am in my office battling a recalcitrant cold whilst surrounded by my 80% female (one 9 months pregnant) crew. The guys are great too. 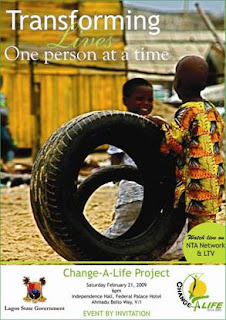 It has been a tough week and next week promises to be even tougher as we work towards the formalization of our 7-year-old CHANGE A LIFE PROJECT. The hard work is easy, we are used to working hard, the difficult part I have found is explaining to people that all this hard work is passion and belief driven. I so hate that term, "oh you are still at work, the dough must be rolling in o". I have never worked or lived for money. Explaining the concept of working for passion or just living through your heart, your passions and your beliefs is hard in a transactional society so when one of my Tutu fellows, the razor sharp, super smart, super efficient, super cool Elsie from Tanzania (l can feel those beautiful eyes of hers throwing daggers my way;-) sent this TED TALKS video, l could only smile. Isabella Allende is one of my favourite authors and here she is on her wittiest form as she talks about passion and more.